Few weeks ago I was doing some yard work and noticed the flower pods on my crepe myrtles. They kinda looked like clusters of small flowers and I wondered if I could do something with them. Do you do that too? You know, ever since I’ve been bitten by the DIY bug it’s been so hard to let go of things especially if it means trashing them. How do you decide what to keep and throw? Anyways that’s when the laundry room reveal came along and I needed some props for the shelves. Added some craft paint and voila! 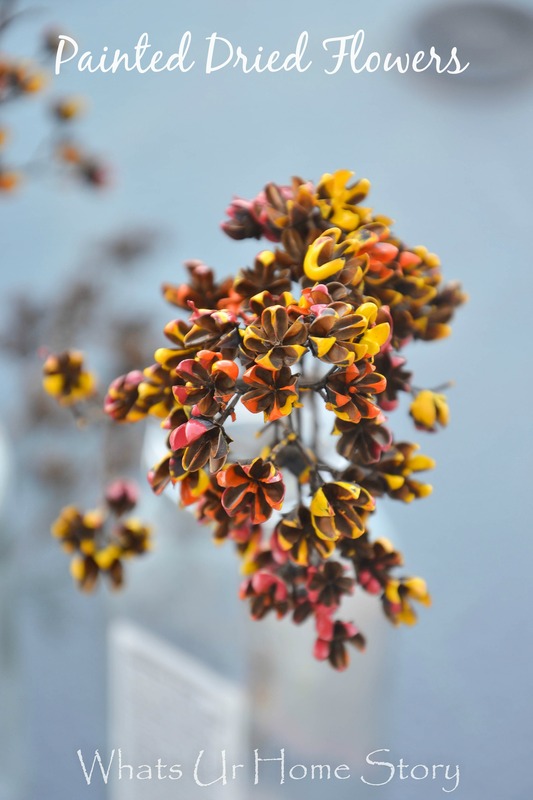 It is subtle but surely adds small pops of color to any space. The process is very simple too. 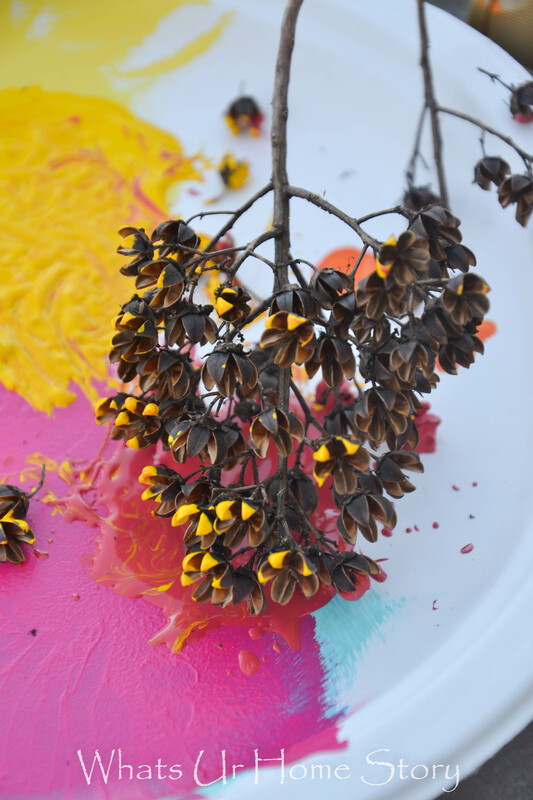 Pour the paints on to the paper plate. 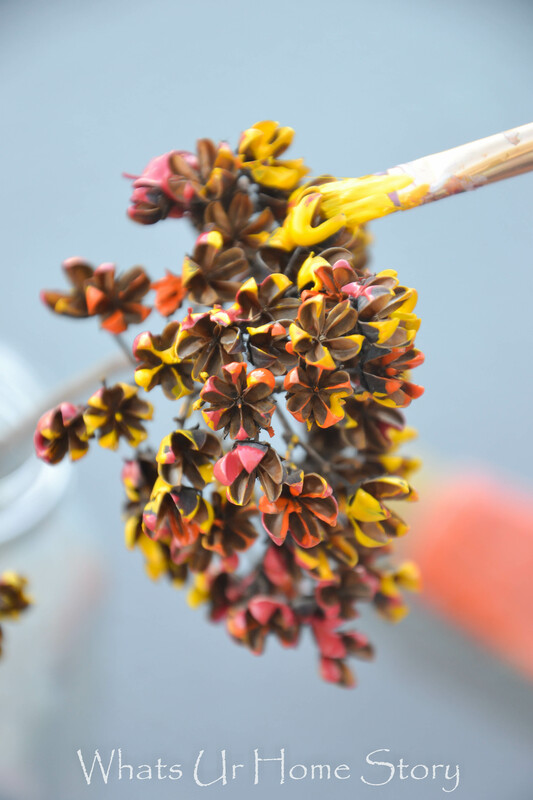 I tried both the dip method where I would gently dip the ends of the flower pods in paint. Not a big fan of this one as you’ve to very careful with how much pressure you use to dip the pods or else you’d end up breaking them. 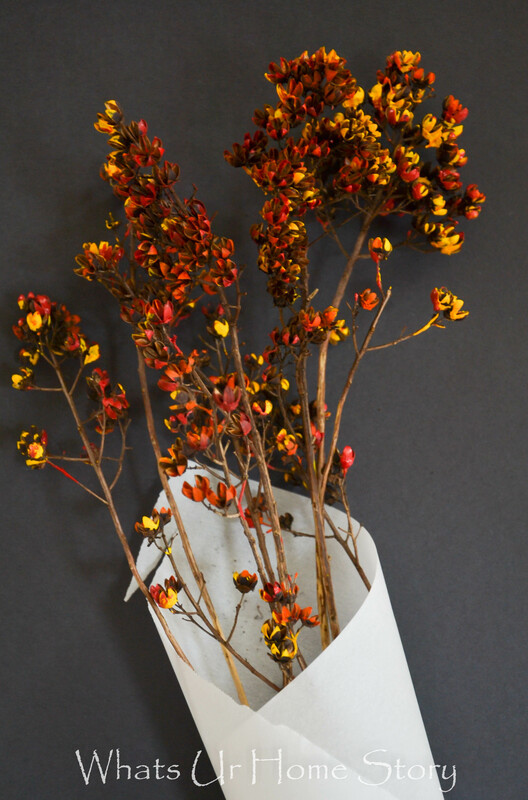 I wanted a mix of colors on my flowers, so just turned the stalk and dipped the new side in a different paint color. Another problem with this method is that it is hard to get to the flowers in the middle. Next I tried using the paint brush and boy, that was a game changer as the pace picked up considerably. 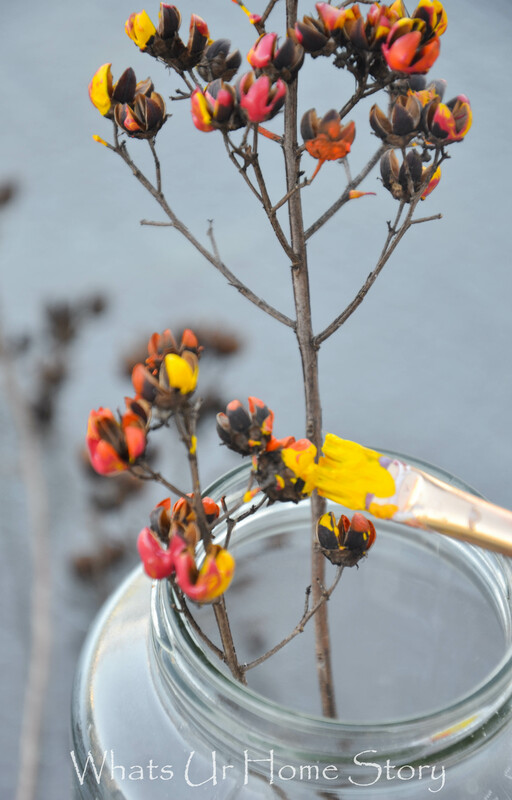 When using a paint brush take care to load your brush lightly or else you’d have blobs of paint that would drip along the stem. Not pretty. 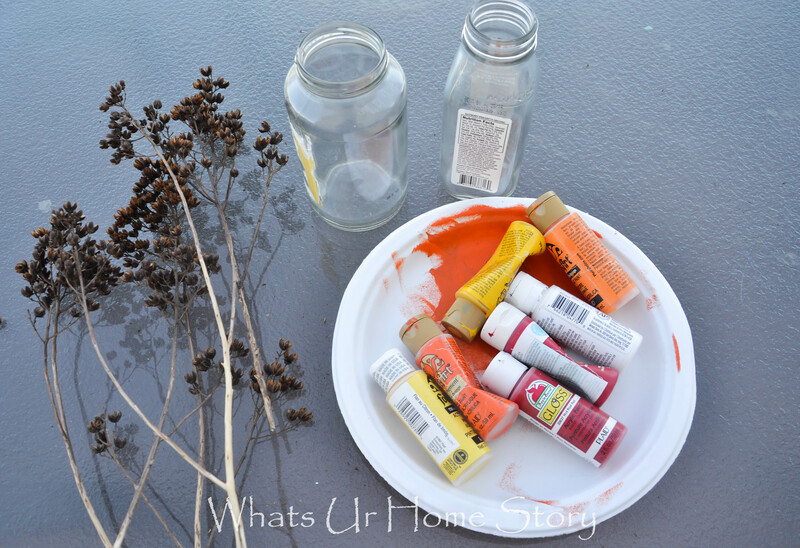 You could also place the stems in empty jars and paint if it is easy for you. 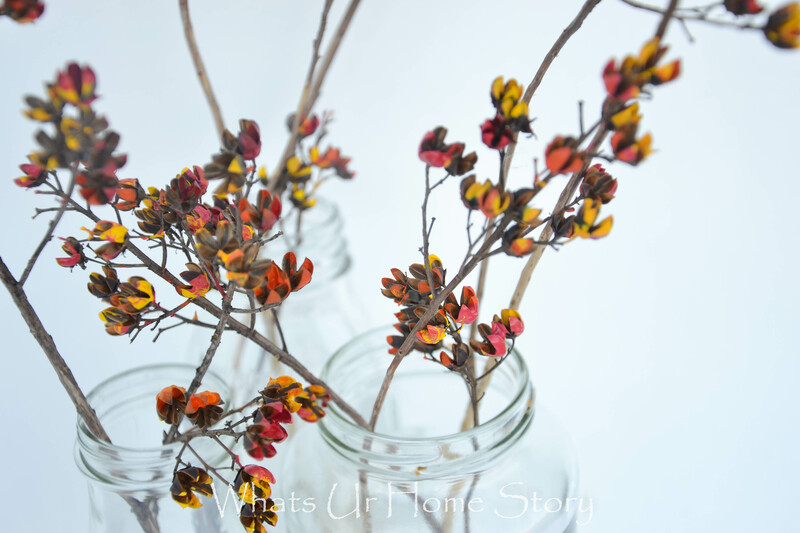 Place the stems in empty glass jars or bottles to dry. There is really no method to the painting. Add whatever colors you like in whatever patterns you want. They will end pretty no matter what. Now come to think of it, I do upcycle a lot of yard stuff, don’t I? First the orange sticks, then my day lily stalks that I painted gold and used in my Fall arrangement. Hmm….Do you recycle things too? How about empty glass jars? Do you keep them or discard them? You might have noticed the ones I used in the post are empty pasta jars and Starbucks Frappucino bottles, some without even removing the label! Loved it!!! 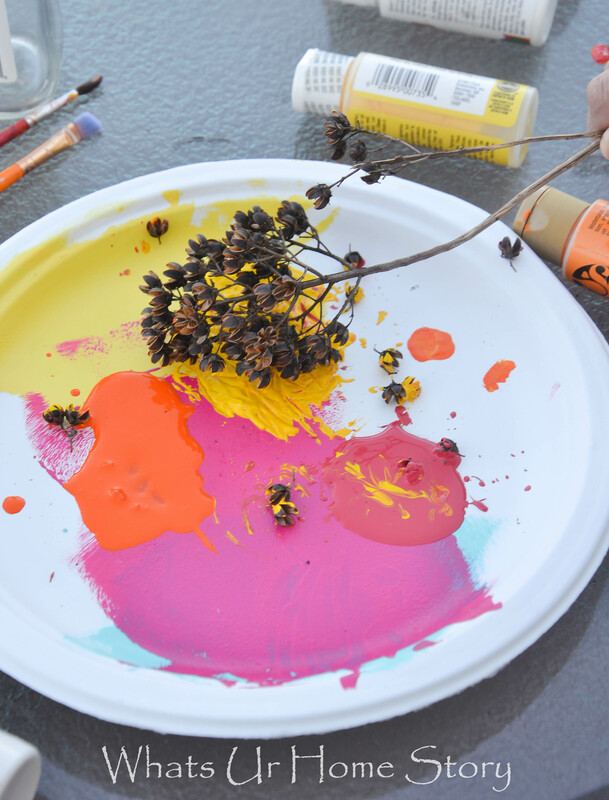 I’ve seen the crepe myrtle flower pods and admired how pretty they looked… but never thought about painting it!!! It is so hard for me discard things now a days. So the first thing that comes to mind now is, paint! SSure, JEn. Spray paint sound like a great idea. 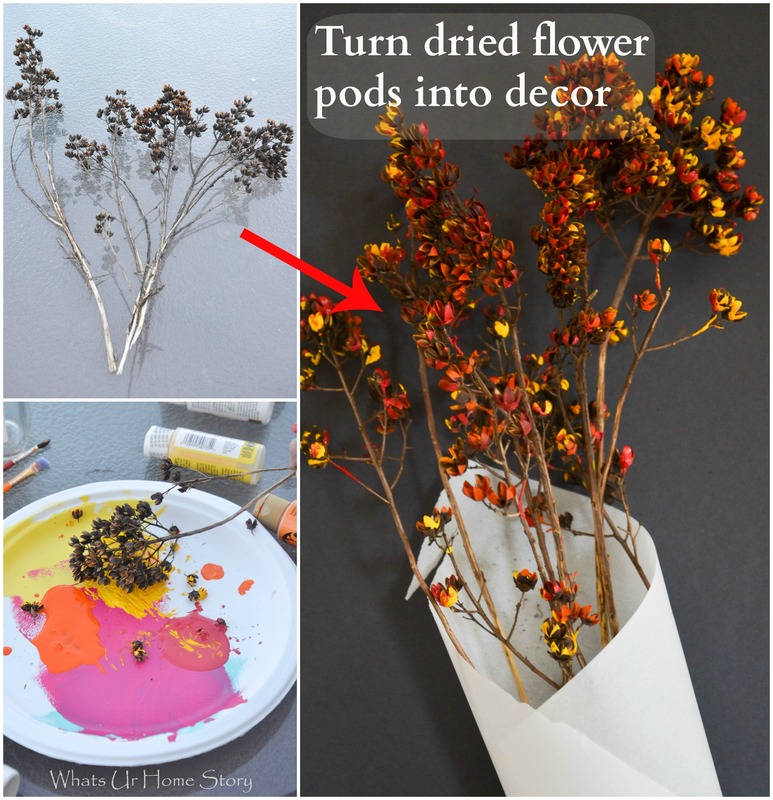 I was thinking of doing it to my dried hydrangeas. I would’ve never thought to do this but I love it! Thank you Jennifer. Often it is these small projects that surprise you. I guess it never hurts to try.